Big Walk for Cancer aims for Guinness Record! You are here: Home / Community / Big Walk for Cancer aims for Guinness Record! 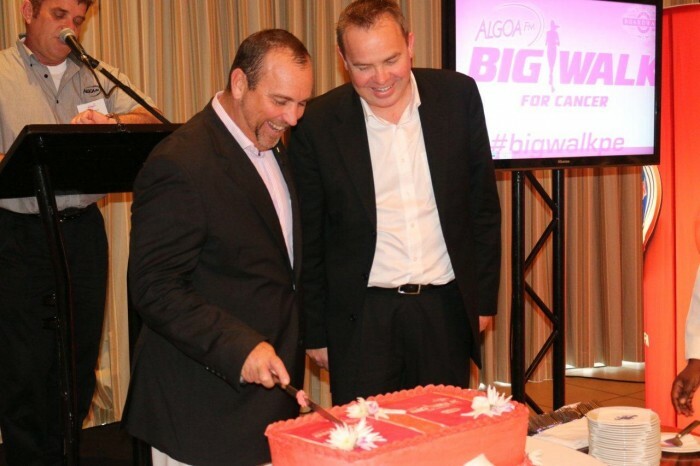 Brett Hoppé (GM at The Boardwalk) celebrates with Dave Tiltmann (MD of Algoa FM) on the announcement of The Boardwalk as the new partner to Algoa FM’s Big Walk for Cancer taking place on Saturday, 25 October. Entrants in this year’s Big Walk for Cancer in Port Elizabeth can expect to make history as the new route takes participants through The Boardwalk in a bid to establish a world record for the most people to walk through a hotel foyer at one time. At the same time they will be raising funds to assist children suffering from cancer. The event was launched on Friday, 5 September at the Boardwalk Convention Centre where Igazi Foundation was officially announced as the beneficiary to this year’s walk. “Research has shown that that there will be a big increase in the incidence of childhood cancer diagnoses over the next three to five years, and the current paediatric oncology ward at Dora Nginza Hospital does not have the capacity to accommodate all the expected patients”, says Dr Johani Vermeulen, head of paediatric oncology at Dora Nginza Hospital. The funds raised will go towards moving the Dora Nginza oncology wards to Provincial Hospital, which is home to the Igazi Foundation’s haematology ward. “With 80% of childhood cancers being blood-related, it makes perfect sense to move the paediatric oncology unit to Provincial Hospital which is already equipped with a haematology ward on the 7th floor”, says Dr Neil Littleton, Founding Member of the Igazi Foundation. This 5km walk will start and finish at The Boardwalk on Saturday, October 25 and the route will take participants through the foyer of The Boardwalk hotel. “Algoa FM and The Boardwalk are both entertainment and lifestyle brands which makes this partnership a formidable combination as entrants can expect a truly unique and fun experience when attending this year’s walk”, says Dave Tiltmann, Managing Director of Algoa FM. Brett Hoppé the General Manager at The Boardwalk says: “This year’s Algoa FM Boardwalk Big Walk for Cancer promises to be one of the biggest and most memorable yet, as we strive towards our goal to grow participation to 12 000 people, and break the Guinness World Record for the most people to walk through a hotel foyer”. “We are grateful to both Algoa FM and The Boardwalk for choosing Igazi as the beneficiary. The funds raised will be used to pay for the many additional medical requirements for the new ward”, says Dr Vermeulen. Work has started on the 25-bed ward at the Provincial Hospital, and it is due to open early in 2015. The closing date for entries to the Big Walk is Wednesday, 22 October. T-shirts will be awarded to the first 6 000 entrants over the age of 18 years old. Registration will take place on Thursday, 23 and Friday 24 October from 13h00 to 19h00 and Saturday, 25 October from 06h00 to 07h30 at The Boardwalk Amphitheatre. The walk starts at 08h00 on the Saturday morning. Entries open on Monday, 15 September and will be available from Brian Bands and Algoa FM.